ESA astronaut Alexander Gerst, NASA astronaut Serena Auñón-Chancellor and Roscosmos commander Sergei Prokopyev were launched into space yesterday in their Soyuz MS-09 spacecraft from Baikonur cosmodrome in Kazakhstan. Their docking with the International Space Station is set for 8 June at 13:07 GMT (15:07 CEST). No larger than a car the trio will spend two days in quiet contemplation after the rumble of their launch. This rare video recorded during the flight to the International Space Station shows how small the spacecraft is (and how to use the toilet). Already cramped with no privacy the spacecraft has limited means of communication, relying on radio contact with Earth at specific times of day. Circling Earth 34 times in its approach to the International Space Station firing up the engines a few times to correct its course. 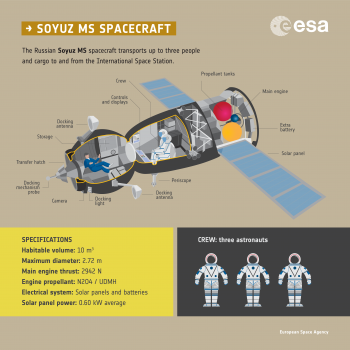 When the Soyuz spacecraft is not firing its engines to change its orbit or docking with the International Space Station the spacecraft is put into a slow spin, but it is not for the astronaut’s comfort! A spin on satellites or spacecraft can stabilise them and keep them pointing in the same right-angle direction to the plane of the spin. The technique is common for so-called ‘spin-stabilised satellites’ to save fuel while keeping them in the correct orientation. The weather satellite Meteosat for example uses this method. The Soyuz is put into a ‘flat-spin’ along its vertical axis to keep its solar panels pointing at the Sun, so the spacecraft is spinning on the horizontal plane or yaw. This is important for keeping the batteries charged. 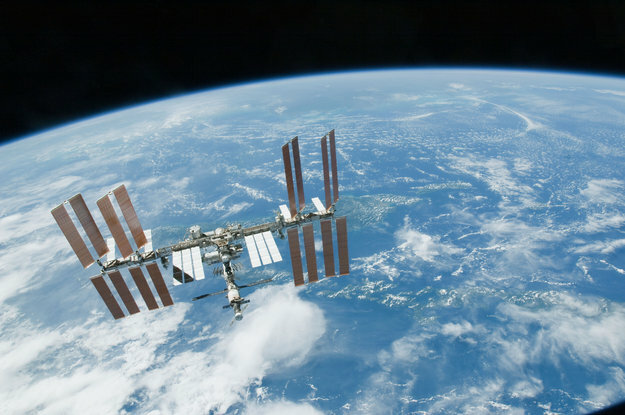 During a six-hour flight to the International Space Station the spinning is not necessary and not performed. There are three ways to start the Soyuz spinning and keep the solar panels in the best position. Manual: the astronauts look through their periscope and make sure they are perpendicular to the Sun. This procedure puts the solar panels the wrong way up so the astronauts set the Soyuz to rotate exactly 180° to get the solar panels absorbing the Sun’s rays. Afterwards they set the flat-spin to keep its correct orientation. Automatic: if the Soyuz has sun sensors installed, they can be used to orient the spacecraft towards the Sun automatically. 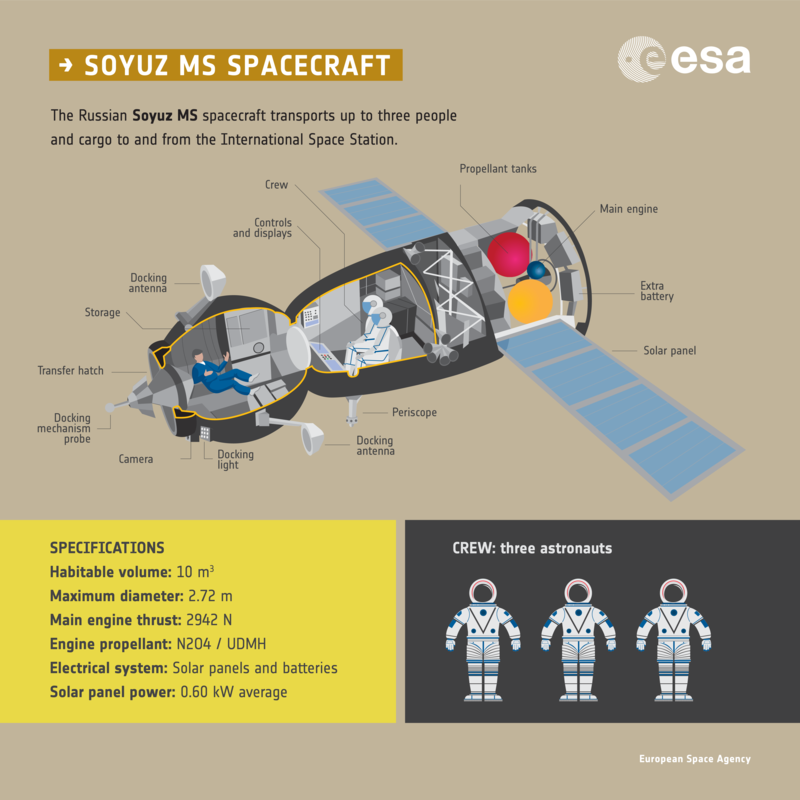 Not all Soyuz spacecraft are fitted with these sensors. Calculated: The flight dynamics team at ground control can calculate the position of Soyuz and the Sun and send the exact coordinates to the spacecraft so that it orients itself accordingly. Since the last burn the crew have been spinning again that was put in motion using the third, calculated method. They are now spinning at 2.4° per second. Far from being an extra level of comfort for the astronauts inside, it actually adds a level of disorientation. In addition, looking out of the window to observe the stars or our planet turns into fleeting. In this video Sergei Volkov himself explains what it feels like to be spinning in the Soyuz, but unfortunately the animation shows the spacecraft spinning on the wrong axis. It’s also the same stabilization effect seen in a hand-spinner / fidget-spinner (I know, so-2017).